A sea of holiday blooms filled the auditorium of Assumption Catholic School as the poinsettia plants arrived on Monday, November 22. 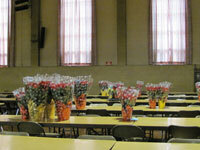 Red, pink, white and marble flowers were ordered by the Garden Club as a Holiday Fund raiser. What a way to kick off the Christmas Season!